Visual imagery is the most common form of imagery used, as human beings are generally extremely reliant on sight to interact with the world. Visual imagery describes what you want the reader to 'see' in their mind. Create vibrant images with carefully selected words. Use two or three adjectives. Select more specific verbs: "saunters" instead of "walk." "His mouth line was so sternly compressed that it had become a squiggle." "The golden yellow sunlight filtered down through the pale new leaves on the oak trees, coming to rest on Jessica's brown toes that were splayed in the red Georgia mud." Auditory imagery appeals to the sense of hearing. Sounds are effectively reproduced by using onomatopoeia, a word which imitates the sound being described. 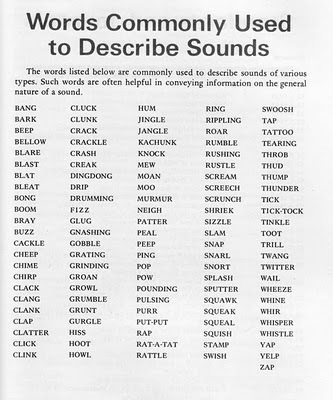 Examples of onomatopoeia include: "boom", "bark", "bang", "whizz". There are of course other words that can be used to describe sounds: "raucous", "piercing", "soothing" and "deep". Here are more words. Focus on sounds. Sometimes students forget the purpose. "She is singing" does not give the reader an auditory image. You must describe the sound being produced. The shriek of the frightened woman echoed in the hallway in shrill, terrifying notes. Olfactory imagery appeals to the sense of smell, which has a powerful link to memory. When a writer effectively describes smells, the reader can have an intriguing sensory experience. Smells can be pleasant, attractive, distinctive or pungent. Here are some more. Focus on describing the smells, not just the thing that is producing it. The smell came in waves, with hints of pepper, spice and burning coal. "The aroma of roasting peanuts, of corn boiling in garlic-infused water, of over-used vegetable oils in which split-pea fritters with cumin seeds have been fried… would activate your taste buds..."
​Gustatory imagery appeals to the sense of taste. Here's a useful list of words that can be used to describe and flavour. Focus on describing the taste, not just the food or thing that is producing it. "The candy melted in her mouth and swirls of bittersweet chocolate and slightly sweet but salty caramel blended together on her tongue." Tactile imagery appeals to the sense of touch: temperature, texture and touch. Focus on how things feel. "It was a sweltering afternoon and the stinging mirage that seemed to follow the road was only broken by the dragging sounds of the pedestrian's rugged boots on the rough asphalt." Kinesthetic imagery is produced by the vivid representation of movement or tension. Focus on describing the movement or experience of tension. Use meaningful verbs and adverbs. Tension: Blobs of slime oozed forcibly from her clenched fist. Adjectives are your best friend. Review units 18 - 22 in your Grammar Plus​.